We all have little tips and ideas. Things that are totally so smart if we would only remember them….or knew them to begin with! Here is your chance to get a head start on all the sewing accessories smarts. 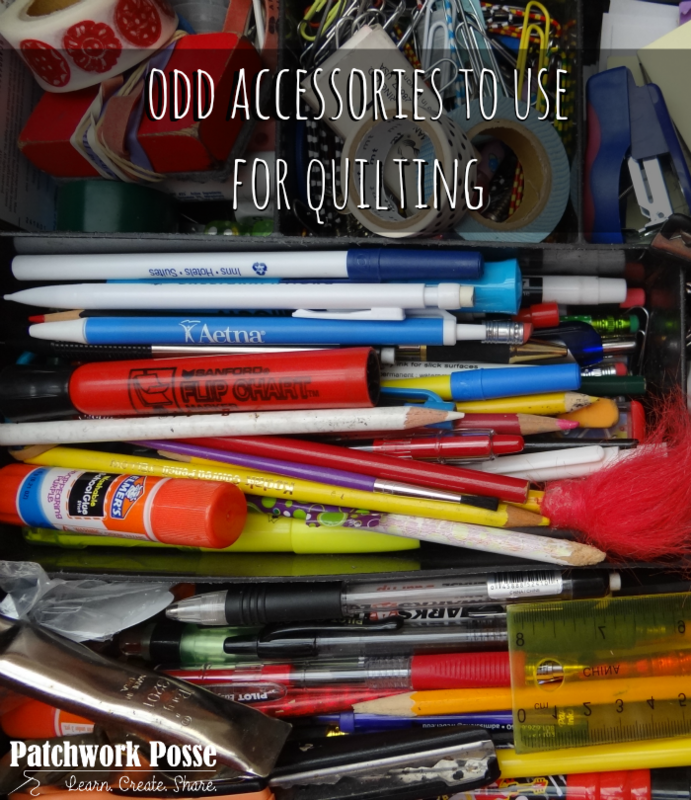 Today we will hit a ton of ideas on using oddball accessories when sewing. I asked a couple of times on the facebook page and group what oddball accessories you used when sewing …and this is the list. There are sooo many ways to use something and sometimes we just over think them. We get in that mindset that we must have the newest and best little gadget out there. One that is perfect for the job- but in reality, sometimes you just don’t. Save some pennies (only so you can use them on a new fat quarter) and think outside of the box. That’s what this is all about. Thinking a little differently at something that might be laying around right next to you or in the other room — or in you honey’s tool box. You never know where you might find your next ‘best friend’ in the sewing notion world. different color electrical tape for seam allowance lines on my sewing machine beds. Vacuum your machine. Use it to blow out the lint in your machine. Easier than dusting and you get out all the lint. blue painters tape to mark my right and wrong sides of solid colored knits. magnetic bowl from harbor freight that’s made to stick to your metal toolbox in the garage. It’s cheaper than the “sewing deemed” magnetic pin holders. Although I’m finding I despise my pins being magnetized! washable glue stick if I need to do fold over hems or attaching things like ribbon on before sewing. Keeps everything in place and washes compleatly out in the laundry. Using a silicone pot coaster for your sewing machine foot pedal. floss threaders for threading woolly nylon through serger loopers. pantry cans too…as an ironing form. quilting thread in the bobbin for gathering fabric. It glides right thru the garment and makes it much easier. round toothpick under flat buttons when sewing them on. It creates a ‘shank’ so buttoning in the buttonholes looks nicer. pot lids, plates, platters .. Anything that makes the size circle I need. Sucrets boxes to hold needles , pens , hooks etc when traveling . An old wooden , rounded lead regular pencil to poke out points and corners. Canned food staff. Very good for holding fabric. Large pencil case for a portable hand sewing (hexagon) sewing kit. walnut pointer- not sure what it’s called, but it’s pointy on one end, blundt on the other and is metal with a decorated handle. I use it as a stiletto and a help guide when sewing small pieces so I don’t run over my fingers. Pedi toe separators…. PERFECT for storing bobbins. ice trays that is the long tubes beside my machine. Its perfect for bobbins. screw driver holders on a peg board to store my scissors in when not in use. For pinking shears just open the hole on the holder a little and they fit perfectly. Silicone mats you can use on your cookie sheets. Use it to help with ironing and to set my iron on if I need to use my whole ironing board for a project. Tupperware citrus peeler also works great for turning & poking. Popsicle stick at the ironing board. Helps with small pieces so I don’t burn my fingers. Use garden gloves to quilt with on my domestic machine. Put your tools in a mason jar next to the sewing machine because the cat can’t knock it over or take the things (stiletto, scissors, marking pen, etc) out and drop them on the floor to play with. Use a plastic bin with see through lid and a battery operated “tap” light as a light box. Use styrofoam boards that come as packing in shipping boxes, glued next to each other, in order to make a design wall. Thank you again to all those who shared their ideas on the facebook page and group. You are the best for when I need to pick some super smart brains. And, if you aren’t in there…you should be! Come join the fun. If you have an idea to add….. leave a comment! There can never be enough here. I made quilt row markers using 1.5″ safety pins and little white alphabet beads to keep my rows in order. I store them on a large safety pin and hang them on the peg board next to my sewing machine. Great ideas. Use a small hook crochet hook – to tie a knot with short thread; grab thread by the sewing machine needle; pull out a straight pin under the pressure foot before you hit it with the needle; pull out stuff in iron holes or in sewing machine; turn fabric corners; use to guide fabric under needle. loved all the original helperes…I like to use a large button with a shank to pin on a quilt marking where I stopped handquilting. scrapbook paper storage boxes are perfect for 12.5 quilt blocks before assembly. michelle– I use those, but haven’t for those blocks! I will have to give it a try. thanks for the heads up! I stapled an old Christmas vinyl table cloth, felt side out, to my wall for a design wall. Fabric sticks to the felt. It is nice and large, I can have a couple of things up at the same time, or have room for a lap size quilt, or a full table runner. oh man– what a great idea! I use Nexcare tape (the nubby bandage stuff that tears lengthwise/crosswise easily) under my rulers and plastic templates. It doesn’t let your ruler slide. I tear off tiny pieces for smaller templates – like my 2.5 inch tumbler and longer strips for my 6×24 inch ruler. Unless I missed this in the list, I use a wood wallpaper seam roller like a wood Iron. It ‘rolls’ over seams and presses them without having to use an iron all the time. I use the left over slivers of soap bars for marking dark fabrics. White works best, then it washes away with water. Great ideas … I like the tablecloth idea for a design board. Super. I use a pair of forceps to help when I’m turning a narrow tube. Grab the end I turn into the opening from the opposite site, lock the forceps and pull. Not explaining well but it works … lol Love all the suggestions. Love all of the great Ideas. I also have a design wall made out of Styrofoam insulation boards and a vinyl tablecloth. It works great. At the Atlanta quilt expo I saw a sewing machine exhibitor using blocks (about the size of chalk board eraser) in his hand to guide fabric through the machine. He didn’t have a business card and I dont remember his name I’d really like to find the blocks. Anyone know what I’m talking about?